<br>What the world needs is a hero. 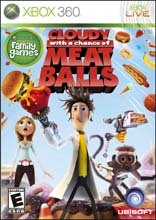 And in the Cloudy With a Chance of Meatballs video game, you can play as Flint, hero-inventor of the action-packed movie who creates a machine that causes food to rain from the sky. When the machine spirals out of control and creates a mess of gigantic 'portions', it's up to you to save the world by using every vehicle and crazy gadget Flint has invented to save his hometown and the world from a food-tastrophe!Hurl hamburgers, sling spaghetti, and fight gummi bears with Flint and his pet monkey Steve to save the world!